Modern, geometric cast iron frames combined with the old world styling of wood slats creates a versatile bench perfect for any commercial or residential area. Available with or without backs. 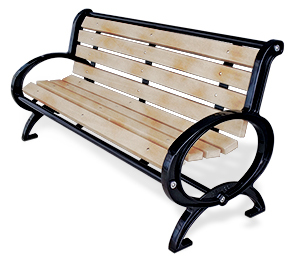 Ideal for parks, campgrounds or even modern downtown areas looking to add a vintage feel, these outdoor benches add a delicate accent to any surrounding. The cast iron frame can be finished in any of the powder-coated color options shown below. For the back/seats, choose between Cedar or Pau Lopé wood planks. Cedar wood has a natural aroma that resists the growth of fungi, and naturally occurring compounds that repel moisture for a long lasting appeal. Pau Lopé is a darker, tropical hardwood that has similar water resistant qualities due to its tight grain pattern. Both wood options are a great choice and will give this outdoor bench a charming appeal that will last for years. 2-1/2" x 1" Cedar or Pau Lopé Slats. Stainless Steel Security Hardware and Carriage Bolts. 11 Ga. Galvanized Steel Brackets & Braces.